CPP 111: What about the Expert-Generalist market position? 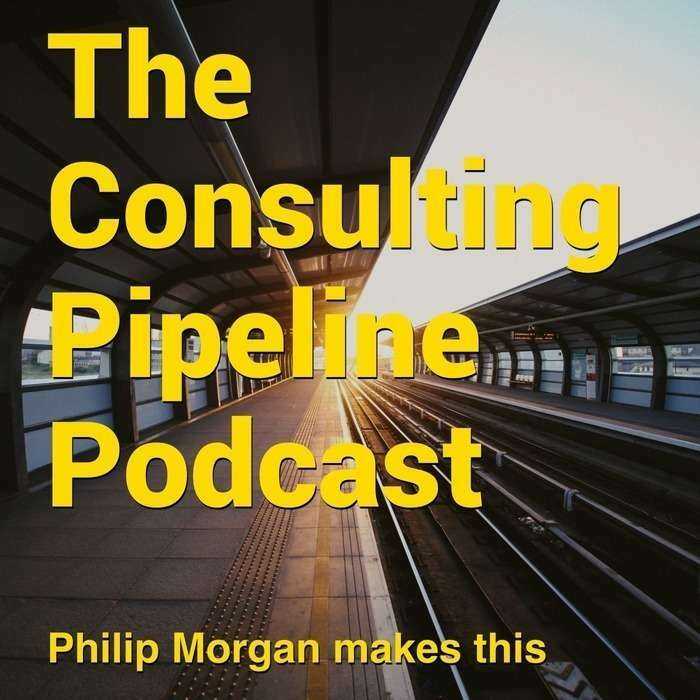 CPP 093: What would you do with these 2 case studies, Philip? CPP 082: Milepost 2 in Garrett St. John's transition from "hands work" to "brain work"
Jake Jorgovan teaches you how to generate leads on LinkedIn. Only works for specialized companies! Ep 63: The "Satisfaction Gap"
The growth spiral, rather than the deaths spiral. How different his life would have been! How many great opportunities would have come his way if he'd pushed through the discomfort! Ep 059: What Plant Was She Trying to Grow? Did it need a deluge, or a steady drip of water? Nothing else untoward was on the walls of that room. Ep 056: Meet me downstairs? Ep 055: Just bypass the factory solenoid! The fix might be easier--or deeper--than you think. A few bits about sales, trust, and objections. Are you using the power of time? Garrett talks about that first part of making the transition from coding to providing technical leadership/advisory services. Ep 051: A Flood of??? What are you measuring? Is it the right thing? The craziest CTA I have ever seen. The room is probably bigger and more interesting than you think! I talk to Josh Doody, salary negotiation expert for software developers, about a recent change to his positioning. Ep 038: But Ours go to 11! Why shouldn't everything be turned up to 11? Does becoming a specialist make you feel like you're pretending? How do you serve competitors within the same vertical? Ep 034: Specialization From Day One? Should you specialize from day one of working for yourself? Either one will get you out of the crab bucket. Ep 029: How do I do market research while I have a full time job? How can you be getting on the phone with research sources when you're chained to your desk at a full time job? Season Wrapup & Ben Krueger: How Can Consultants Use Podcasting to Generate Leads and Revenue? A spoke with Ben Krueger of Cashflowpodcasting about how podcasting can be a great way for a consultancy to get leads and new business. Also... a few notes about the end of Season 1 of this show and what you can look forward to in Season 2! I spoke with Samuel Hulick about his journey from general UX designer to being well known as the "user onboarding guy". Paul Jarvis: Is Saying No Part of Building a Successful Business? I spoke with Paul Jarvis about the benefits of focusing on a specific audience. Paul is perhaps the most internet famous of my guests so far, and I was interested in speaking with Paul about the role that saying "no" plays in building a successful freelance business. Gale Stafford has recently answered some tough questions in his own business. Questions like how to validate a market focus, and how to deal with the fear and doubt that accompany a low-information high-stakes decision. Who decides who is really an expert? Is expertise about knowing everything, or is it about something else? This episode is a sort of meditation on expertise. I spoke with interaction designer Nick Disabato about one of the most common fears around specialization: the fear of boredom. In this episode, Nick shares his journey towards specialization. This conversation brought out several fascinating points about choosing a specialization, changing a specialization, and using specialization as a tool to create a sustainable profitable business. We tend to fear that if we specialize in solving an expensive problem, we will get bored very quickly with our work. Then what? Will we be stuck in a boring job that we created for ourselves and crying ourselves to sleep on $500 bedsheets? Will we be doing the exact same set of activities day in and day out for our clients? Jonathan Stark talks about getting past the paradox of choice when choosing a focus. What if You Want a List But DON'T Want to Create Original Content? In my coaching and consulting work, I've encountered several situations where my client sees the benefit of building a list but feels quite nervous about putting themselves out there by writing content for a list. I have an idea that I think will help. Kurt Elster saw explosive growth when he moved his agency from building brochure websites to a focus on a single service for a single platform. My guest Eric Davis was booked solid for months after he became "the Redmine guy". Well, it's about overcoming the paradox that prevents our consulting businesses from becoming highly compensated, highly in demand.